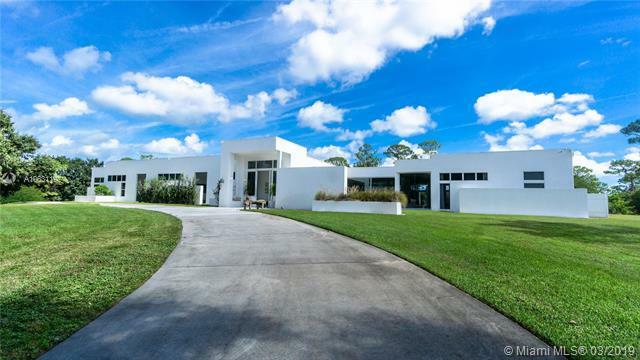 This contemporary, single story estate sits on 20 acres in the exclusive, horse friendly and guard gated Ranch Estates enclave within prestigious Ranch Colony. This masterpiece,resides behind it's own gated entrance and features both indoor and outdoor pools. Massive open living spaces are encased by floor to ceiling, high impact windows and doors exposing the grandeur of the estate grounds. Polished concrete floors and Italian cabinetry add to the contemporary experience. For golfers, there are 2 options; Jonathan's Landing and private Dye Preserve. 2700 lit surface for landings and a runway.The property is located close to the I-95 and Turnpike and minutes away from beautiful beaches, restaurants and surrounded by a serene nature preserve. Helicopter pad can be built, Seller Financing .